Hey everybody, Radley Martinez is fighting! Oh, and eight dudes duke it out to fight for the right to get beaten down by Hector Lombard. I guess when you’re featured on an ESPN program, you’re instantly more visible than most of the fighters in Bellator. 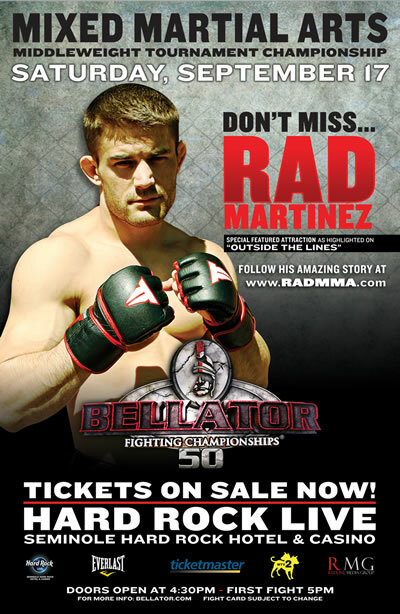 Still, Rad is getting a lot of hype considering he’s not even on the main card. Middleweights like Alexander Shlemenko, Bryan Baker, and Sam Alvey will be competing in the quarterfinals of Bellator’s season five middleweight tournament. Baker has a pretty impressive Bellator record at 5-1 with the sole loss to Alexander Shlemenko. He’s defeated the likes of Jeremy Horn, Joe Riggs, Eric Schambari, and Matt Horwich during his time with the promotion. Hess has also done pretty well for himself, making it to the finals of Bellator’s inaugural middleweight tournament before losing in the championship match against Hector Lombard. Jared Hess has strong wrestling while Baker hasn’t really been tested by a lot of good wrestlers, though he does have a loss to Chael Sonnen on his record. Hess was a state champion wrestler and a Division 2 All-American in college, so he could do enough to control this fight and take the victory. I just don’t feel confident enough to pick Hess over a guy with so many big wins in the last couple of years. Baker’s a much more well rounded fighter and I’ll take him to win by TKO in this one. Alexander Shlemenko has big power. Zelg Galesic is the last man to have lost to Kazushi Sakuraba. I think Shlemenko is the clear choice here. This is probably the toughest fight for me to pick. Vianna is one of the best Brazilian Jiu-Jitsu practitioners in MMA and he has some very good kickboxing. Sam Alvey is a goofy white dude whose girlfriend, Chicagoland’s McKey Sullivan, won her season of the America’s Next Top Model reality show. Personally, I stopped watching ANTM after cycle 10 where plus-sized Whitney injustly won out over girls like Fatima and Anya. I don’t think the judges ever made the right calls after the first few seasons and they just picked girls to win for the sake of going against the grain. Nicole in cycle five, Dani in cycle six, and CariDee in cycle seven are good examples of this. Seriously, that’s three seasons in a row where Tyra and her sheep just chose some plain, boring girls who were clearly inferior. Oh, uh…Vitor Vianna will win. I’m a man, grrr. Brian Rogers is a wrestler with some very good striking, while Victor O’Donnell is a submission artist with eight submission wins and a TKO victory over Rafael Natal. O’Donnell has faced his share of tough competition, including fights against Natal, Costantinos Philippou, and Marcus Vanttinen, while Rogers is fairly untested in his young career. I’ll take O’Donnell by submission.